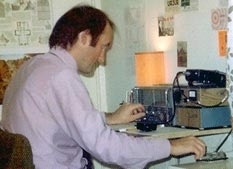 My first call was G8AWG and I used it to operate other stations including that of my mentor G4PJ, the late Bill Honeywill, in Salcombe. I also held the call F0HXF (French reciprocal licence) in the late 1980s and G9BGU /G9BIB for ELF/VLF through-ground experiments in the late 1960s. The photo shows (a slightly younger!) me operating in 1974. Ham radio started for me with a Christmas present of a Heathkit "Electronics Workshop" in 1961 and this had me hooked. That first Christmas I was already DXing on MW and thinking about shortwave and QSL collecting for the first time. I had no idea how important amateur radio would be to me and how it would lead me into a fascinating career spanning well over 30 years. There have been plenty of changes but that has been some of the fun. In those far off days radio was magic, and it still is. How pressing a morse key can result in a few hundred milliwatts of RF travelling across mountains and oceans to a simple receiver with just a few components on the other side of the world is still quite remarkable. When I started there was not much SSB and very little commercial gear about - people rolled their own gear or converted ex-military radios from WW2. One of my first receivers was an ex-military DST100 that I bought for £7. It was SO heavy! I think it was originally designed for use in tanks. Today a lot is different but I still get great pleasure from simple ham radio especially QRP operation using home made equipment. Having said that, a lot of my gear is commercial. My first TX operation was on 160m AM/CW with a small rig using BFY51s in the oscillator and PA. The design came from Practical Wireless in late 1968. With it I worked a few locals from my QTH at the time, Kingsbridge in Devon. When I first came to live in Cambridge my favourite rig was a home brew 2m 10mW AM rig used with a super-regen receiver. Despite its simplicity this worked all over the area very well but it became outmoded when the local 2m repeater, GB3PI, started and everyone moved to FM. I first ventured onto 10m in the mid 1970s with a simple CW TX running about 1W. This was an eye-opener to me as I had no idea that something this simple with a loft dipole could work so many countries. This was the main rig for several years. My first commercial HF rig was the Yaesu FT7. This rig put out about 10W pep on 80-10m and allowed me to work some great DX as far as VK, ZL, and VP8 in Antarctica on 10m SSB. Equipment in use today includes the Yaesu FT817ND. The FT817ND and before that the FT817 has resulted in some quite amazing handheld DX contacts. So far, 5 continents have been worked on handheld QRP SSB and the best DX using the rig indoors with just a Miracle Whip has been LU on 10m SSB at over 11000kms. An MX2 2m 200mW SSB QRP rig has also been used on occasions. Also out portable a little VX1 or VX2 dual bander handheld is used. They are capable of working good distances from hilltop sites and have given me loads of fun. They also has wideband receive coverage including aircraft band, VHF FM radio, TV sound and MW broadcast. The VX2 even has full HF coverage. My favourite aspect of amateur radio is operating with very low power (QRP) and making long distance (DX) contacts around the world. On 28MHz (10m) contacts all over the world have been possible with just 1W of SSB. when the sunspot count is higher. On 50MHz (6m) most parts of Europe have been contacted with 1W QRP to a wire dipole or vertical. I have even managed 1 stateside 6m CW QSO. One of the most interesting DX contacts on 144MHz (2m) was a cross-channel contact over 100 miles with a homemade 10mW AM 144MHz handheld. I've also worked some 144MHz FM DX well into Europe with handheld QRP using 1/2 wave antennas on the portable. My best DX on 70cms FM is well into Germany. Another favourite band is 21MHz (15m) using the Pipit 800mW CW transceiver I designed (see SPRAT No 88, Winter 1987-88) and on this site. A few years ago I did some DXing with the MFJ Cub on this band and worked some good DX with it with a simple dipole. The best DX was a YV in S.America but it should be fine for world-wide DX with some patience. Another rig I've tried is a derivative of the famous Pixie using just 4 transistors in an 80m CW transceiver using about 20 parts only, and that includes the crystal! The magic is using the TX PA as a mixer in a direct conversion receiver. With a lash-up on a piece of copper laminate on the desk and a morse key formed from a piece of wire touching the copper laminate ground plane (!) I managed to work 200 miles on 80m CW with it to just a 1/4 wave antenna down the garden and a central heating ground. A similar lash-up was made for 15m although I did not work anyone with it. It would certainly be capable of working Europeans in the summer sporadic-E season and I'm tempted to rebuild it. Today I tend to work most HF and VHF bands in a none to intensive manner, often with FT8 to save my poor voice. I enjoy the occasional contest "buzz" but am quite happy working locals and run-of-the-mill contacts too. Many examples of my simple QRP rigs may be found on this site. In recent years I bought a network radio (Android based) although it is not used much. It is mainly used for Echolink.